KAESERSigma Compressed Air Controller is the control center for your compressed air supply and key technology for Industries. 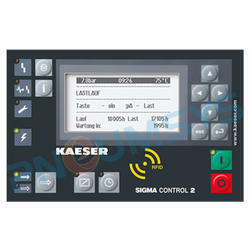 Kaeser Sigma Compressed Air Controller with SIGMA CONTROL 2 unit coordinates compressed air generation and consumption. With its intelligent control, this advanced system prevents inefficient energy usage, especially in partial load operation. Kaeser offers various compressor controllers suited according to particular requirement. The SIGMA CONTROL 2 fulfils the highest requirements for an internal compressor controller and is based on advanced industrial computingtechnology. The control unit is linked with interchangeable input and output modules, allowing flexible matching to all available Kaeser rotary screw compressors, screw blowers, reciprocating compressors and rotary blower systems, as well as to external communications systems. The industrial PC saves the last 200 operational events, helping you and Kaeser Support to quickly find and reproduce faults. Furthermore, the built-in web server enables you to display operational data, maintenance and fault messages on any PC. The SIGMA CONTROL 2 offers 30 selectable languages. The logical menu structure simplifies operation. Software updates and operating parameters can be quickly uploaded and transferred via the convenient SD card slot. This minimises service costs and allows the SD card to be used for (long-term) storage of key operational data.